SINGAPORE - A new centre that looks at how data and science can be used to make the work of Home Team officers easier and more efficient was launched on Monday (Oct 17). This includes looking at smarter surveillance systems, virtual reality training and the physical and mental needs of Home Team officers relative to their working environment, such as managing fatigue among officers. Housed at the Home Team Academy in Old Choa Chu Kang, the centre will use science, technology and data analyses of officers' performance to ensure that the systems and equipment these officers use are compatible for work on the ground. The centre, which is split into two areas, each the size of a four-room flat, also develops training systems that deviate from traditional methods. For example, officers can be trained using virtual reality simulations, with their eye movement and response to their situation tracked. They may also be trained to control unmanned equipment. The Home Team includes the police, Singapore Civil Defence Force, Immigration and Checkpoints Authority, Singapore Prisons Service and the Central Narcotics Bureau. Speaking on the training for the unmanned system, Dr Naresh Kumar, head of the Home Affairs Ministry's Office of the Chief Science and Technology Officer, said that an officer will be able to learn how to dextrously control the system's interface to manoeuvre an equipment from a distance. The centre will also develop other systems such as one that can track suspicious people and objects. For example, if there is an unattended bag reported, the system could find out - by pooling footage from security camera - where the bag is, when it was placed there and who put it there. Dr Naresh added that it is timely to incorporate such technology in a digital age. 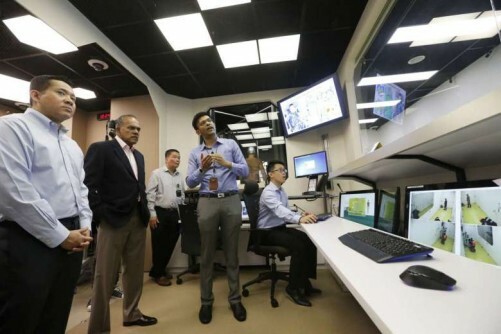 Minister for Home Affairs K. Shanmugam, who launched the centre, said that in the face of declining manpower and increasing demands, technology becomes vital. "The equipment has got to work for us, and the training in virtual environments is being upgraded," he said, adding that these equipment and systems exist now but are being "significantly upgraded".